NASCAR Camping World Truck Series driver Austin Dillon (33) leads during the UNOH 175 at New Hampshire Motor Speedway. Dillon went on to win the race. 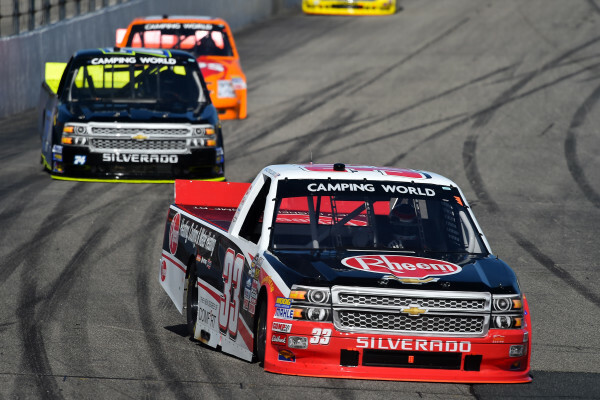 Fort Kent’s Austin Theriault, thanks to a late-race pit strategy, wound up finishing eighth in NASCAR’s UNOH 175 Camping World Truck Series race at New Hampshire Motor Speedway Saturday afternoon in Loudon, New Hampshire. It was his fourth top-10 finish in seven races for the Brad Keselowski Racing team. Theriault qualified ninth but wound up getting shuffled back to 18th midway through the race when his jackman prematurely entered the pit box on a pit stop, causing Theriault to be penalized and start in the back in the pack. Theriault eventually worked his way up to 13th and stayed out on the track when the leaders came in for green flag pit stops. Theriault wound up leading the race for nine laps and crew chief Chad Kendrick’s strategy to stay out paid dividends when John Wes Townley spun out on lap 135 resulting in a caution. Theriault then came to pit road and restarted seventh. When his Brad Keselowski Racing teammate Tyler Reddick got turned around to cause another caution on lap 160, Theriault was in sixth place. There were 10 laps remaining on the final restart and Theriault ended up losing two spots over the final 10 laps to bring his truck home in eighth place. Reddick finished 15th and Austin Dillon won the race. Theriault remained 24th in the points standings despite having run fewer races than anyone ahead of him. The next race is the Rhino Linings 350 at 10 p.m. Saturday at Las Vegas Motor Speedway.